#1. This week's number one is former international forward Katherine Plouffe (190-92, college: Marquette, currently plays in France). She led Bourges to a victory over the league leader Bretagne Basket (10-12) 91-75 in the French LFB in Wednesday night's game. Plouffe was MVP of the game. She recorded 20 points, 6 rebounds and 6 assists in 31 minutes on the court. It was the game of the round between two top 4 ranked teams. Tango Bourges Basket (18-4) is placed third in the LFB. It was her team's ninth consecutive victory in a row. This year Plouffe averages: 9.7ppg, 4.7rpg, 2.0apg, 1.3spg, 2FGP: 48.9%, 3FGP: 36.4% in 22 games she played so far. She played for the Canadian senior national team two years ago. #2. Second place goes to an international power forward Nayo Raincock-Ekunwe (188-91, college: Simon Fraser, currently plays in France) is a teammate of previously mentioned Katherine Plouffe and both played together in the last French LFB game. Raincock-Ekunwe contributed to an easy victory against the league leader Bretagne Basket (10-12) 91-75. She recorded 12 points and grabbed 8 rebounds. Raincock-Ekunwe has relatively good stats this season: 11.3ppg, 6.0rpg, 1.4apg, 1.1spg, 2FGP: 68.8%(99-144), 3FGP: 32.1% and FT: 57.7%. She is in the roster of the Canadian senior national team. #3. The Canadian player who performed third best last week abroad was an international power forward Miranda Ayim (191-88, college: Pepperdine, currently plays in France). Ayim was the main contributor in a Basket Landes' victory against the closely-ranked Lattes Montpellier (16-6) 66-54 in the French LFB on Saturday night. She was the best player in that game. Ayim scored 16 points, grabbed 6 boards, dished 3 assists and stole 5 balls in 28 minutes. Basket Landes (12-10) is placed seventh in the LFB. It's Ayim's fourth season with the team. This year she has relatively solid stats: 13.0ppg, 5.0rpg, 1.1apg, 1.3spg, 2FGP: 51.3%, 3FGP: 34.2% and FT: 72.7% in 24 games. Ayim is also a member of the Canadian senior national team. #4. Forward Michelle Plouffe (193-92, agency: Basket Promotion Agency, college: Utah, currently plays in France) contributed to an easy victory against the eighth-ranked Tarbes (9-13) crushing them 82-61 in the French LFB in Saturday night's game. She scored 12 points, grabbed 5 rebounds and dished 4 assists (was perfect 5-for-5 from the free throw line). Union Lyon Basket Feminin (18-4) is placed second in the LFB. It was her team's third consecutive victory in a row. It's Plouffe's first season with the team. Plouffe has reliable stats this year: 11.8ppg, 6.1rpg, 3.6apg and 1.7spg. She is also Canadian national team player. #5. International small forward Jamie Weisner-Scott (178-94, agency: LBM Management, college: Oregon St., currently plays in Russia) contributed to a Dynamo NR's victory against the closely-ranked Inventa (10-8) 85-74 in the Russian PBL last Monday. Weisner-Scott was the top player that evening. She scored 25 points, grabbed 8 rebounds and dished 5 assists in 40 minutes; quite an impressive performance considering it's only Weisner-Scott's third season in pro basketball. Dynamo Novosibirsk Region (5-13) is placed eighth in the PBL. Weisner-Scott has individually a very good year with high stats. She averages: 18.9ppg, 5.9rpg, 2.1apg and 1.8spg in 17 games. Weisner-Scott plays currently for the Canadian national team. #6. Point guard Miah-Marie Langlois (173-91, college: Windsor, currently plays in Russia) is a teammate of previously mentioned Jamie Weisner-Scott. But that was another game of her team in Russian PBL which we would like to mention. Langlois was the major contributor in a Dynamo NR's victory against the league outsider Dynamo Moscow (0-18) crushing them 84-64. She recorded 22 points, 4 rebounds, 8 assists and 5 steals. Dynamo Novosibirsk Region (5-13) is placed eighth in the PBL. Langlois' stats this season are: 12.0ppg, 4.3rpg, 4.7apg and 2.7spg. She is an international player who is currently on the senior Canadian National Team roster. #7. Former international swingman Cassandra Brown (189-92, college: Portland, currently plays in Greece) could not help Dafni Agioy (13-9) in their last game. Despite her good performance Dafni Agioy was edged 79-76 in a derby game by the lower-ranked (#6) Panionios. Brown recorded 12 points and grabbed 6 rebounds in 39 minutes. They ended the series of four consecutive victories. Her team will play only one more game in the Regular Season. And that game will be critical. Brown's stats this year are: 14.5ppg, 5.6rpg and 1.2apg in 22 games. She used to play for the Canadian national team five years ago. #8. An experienced swingman Kimberley Gaucher-Smith (183-84, also represented by Basket Promotion Agency, college: Utah, currently plays in France) was not able to help Mondeville in their game against Villeneuve D'Ascq (9-13) in the French LFB. Despite her very good performance in Saturday night's game Gaucher-Smith was the top scorer with 15 points. She also added 6 rebounds and dished 3 assists. Gaucher-Smith is one of the most experienced players in a team as it's her fourth year in Mondeville's roster. Gaucher-Smith averaged so far 11.7ppg, 5.7rpg, 2.3apg and 1.1spg. She plays currently for the Canadian national team. #9. International center Alexandria Kiss-Rusk (193-93, agency: Interperformances, college: McGill, currently plays in Germany) was not able to secure a victory for one of league's weakest teams BC Pharmaserv Marburg (15-5) in their game against Gruner Stern Keltern (15-5) in the German DBBL. Kiss-Rusk scored 6 points, grabbed 9 rebounds and dished 3 assists in 31 minutes. BC Pharmaserv Marburg lost 59-66 on the road to the second-ranked Gruner Stern Keltern. Kiss-Rusk averaged so far 12.5ppg, 8.6rpg, 1.7apg and 1.4bpg in 25 games. She is also in the roster of the Canadian national team. #10. Point guard Shona Thorburn (178-82, another player represented by Basket Promotion Agency, college: Utah, currently plays in France) is a teammate of previously mentioned Kimberley Gaucher-Smith. However that was another game of her team in French LFB which brought her to that list. Thorburn helped Mondeville win their game against the closely-ranked Hainaut (7-15) 73-58. She recorded 11 points, 5 rebounds and 3 assists. USO Mondeville (2-20) closes the standings in the LFB. Thorburn's overall stats this season are: 7.1ppg, 4.1rpg, 5.3apg and 1.1spg. She is a former international player as three years ago she still played for the Canadian senior national team. #11. Former U19 international forward Samantha Cooper (188-95, college: Fairfield, currently plays in Luxembourg) helped Grengewald win their game against the second-ranked Amicale 51-45 in the Luxembourg Total League on Saturday night. Cooper had a double-double by scoring 11 points and getting 16 rebounds in 40 minutes. Cooper has very impressive stats this year: 20.4ppg, 13.5rpg and 2.4apg in 25 games. She used to play for the Canadian U19 national team six years ago. #1. Kim Pierre-Louis (183-F/C-93, college: Massachusetts, currently plays in Germany) led Gruner Stern Keltern to a victory over the closely-ranked BC Pharmaserv Marburg (15-5) 66-59 in the German DBBL in Wednesday night's game. Pierre-Louis was the top player that evening. She scored 15 points and grabbed 6 rebounds in 27 minutes. It was the game of the round between two top 4 ranked teams. Gruener Stern Keltern (15-5) is placed second in the DBBL. It was her team's eighth consecutive victory in a row. Pierre-Louis' stats this year are: 14.1ppg and 7.5rpg in 24 games she played so far. #2. Sara Simovic (173-G-95, agency: BeoBasket, college: UFV, currently plays in Croatia) contributed to a Pula C.Tours' victory against the closely-ranked ZKK Split (14-8) 78-69 in the Croatian Prva Liga last Tuesday. She scored 12 points, grabbed 9 rebounds and dished 4 assists. It was the game of the round between two top 4 ranked teams. ZKK Pula Crnja Tours (16-6) is placed fourth in the Prva Liga. It was her team's fourth consecutive victory in a row. Simovic averaged so far 12.7ppg, 5.6rpg, 2.8apg and 1.8spg. #3. Experienced Rachael Vanderwal (175-G-83, college: Boston U., currently plays in Spain). Vanderwal could not help Gernika (18-8) to beat Valencia (16-10). She scored 5 points and added 3 assists in 23 minutes. Gernika was crushed 75-49 at home by the lower-ranked (#4) Valencia. This year Vanderwal's overall stats are: 7.7ppg, 3.2rpg and 2.5apg in 29 games. She has a dual citizenship: Canadian and British. #4. Melissa Rondinelli (184-F/C-91, college: Western, currently plays in Belgium) was not able to help Laarne in their game against Jeugd Gentson (8-19) in the Belgian Top Division Women. Rondinelli cannot count Saturday's game as one of the best ones. She recorded only 2 points and blocked 2 shots. Laarne was defeated 53-44 on their home court in Laarne by the lower-ranked Jeugd Gentson (#10). Rondinelli's team will play only one more game in the Play-Out Round. And that game will be critical. Rondinelli averaged so far 12.3ppg, 4.2rpg and 1.5bpg. She is another player who holds two passports: Canadian and Italian. #5. Rachael Bland (, college: Lakehead, currently plays in United Kingdom) was not able to secure a victory for Newcastle Eagles (20-10) in their game against Mystics (14-8) in the British WBBL. Bland cannot count Saturday's game as one of the best ones. She recorded only 3 points and added 3 passes. Newcastle Eagles was edged 81-79 on the road by the lower-ranked Mystics (#4). Bland's team will play only one more game in the Regular Season. And now that game is very crucial. Bland's overall stats this season are: 3.1ppg, 4.4rpg, 2.3apg and 1.1spg. #1. This week's number one is an international small forward Jamie Weisner-Scott (178-94, agency: LBM Management, college: Oregon St., currently plays in Russia). She could not help Dynamo NR (5-13) in their last game. Despite Weisner-Scott's very good performance Dynamo NR was edged 61-58 at home by the one of league's weakest teams (#9) Spartak Noginsk. She was the top scorer with 25 points. Weisner-Scott also added 7 rebounds in 37 minutes on the court; quite an impressive performance considering it's only her third season in pro basketball. It was Dynamo NR's third consecutive loss in a row. Weisner-Scott has individually a very good year with high stats. She averages: 18.1ppg, 5.4rpg, 1.9apg, 1.6spg, 2FGP: 46.9%, 3FGP: 42.9% and FT: 89.1% in 14 games she played so far. 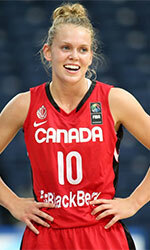 Weisner-Scott is currently a member of the Canadian senior national team. #2. Second place goes to former international swingman Cassandra Brown (189-92, college: Portland, currently plays in Greece). She led Dafni Agioy to an easy victory against the eighth-ranked Proteas (9-12) 81-65 in the Greek A1 last Sunday. Brown scored 17 points, had 5 rebounds, passed 3 assists and added 2 blocks. AO Dafni Agioy Dimitriou (13-8) is placed third in the A1. It was her team's fourth consecutive victory in a row. They will play only one more game in the Regular Season. And that game will be critical. Brown has relatively good stats this season: 14.6ppg, 5.6rpg, 1.2apg, 2FGP: 52.0%, 3FGP: 33.3% and FT: 78.1%. She played for the Canadian national team in 2014. #3. The Canadian player who performed third best last week abroad was an international center Alexandria Kiss-Rusk (193-93, agency: Interperformances, college: McGill, currently plays in Germany). Kiss-Rusk was not able to help one of league's weakest teams BC Pharmaserv Marburg (15-5) in their last game. Despite her very good performance BC Pharmaserv Marburg lost 61-75 on the road to the second-ranked Gruner Stern Keltern. Kiss-Rusk was the top scorer with 15 points. She also added 7 rebounds in 32 minutes; not bad, considering it's only Kiss-Rusk's third season in pro basketball. This year Kiss-Rusk has relatively solid stats: 12.8ppg, 8.6rpg, 1.7apg, 1.4bpg, 2FGP: 54.3%, 3FGP: 25.7% and FT: 69.4% in 24 games. She has a dual citizenship: Canadian and Hungarian. Kiss-Rusk is also a member of the Canadian senior national team. #4. Center Quinn Urbaniak-Dornstauder (193-95, college: ASU, currently plays in Spain) was not able to secure a victory for Mann Filter (10-16) in their last game. Despite Urbaniak-Dornstauder's good performance Mann Filter was crushed 79-56 on their home court in Zaragoza by the leading Perfumerias Avenida. She had a double-double by scoring 12 points and getting 10 rebounds in 23 minutes. It's Urbaniak-Dornstauder's first season with the team. This year Urbaniak-Dornstauder's overall stats are: 6.0ppg and 4.3rpg in 26 games. She used to play for the Canadian national team back in 2016. #5. International point guard Miah-Marie Langlois (173-91, college: Windsor, currently plays in Russia) is a teammate of previously mentioned Jamie Weisner-Scott and both played together in the last Russian PBL game. Langlois couldn't help Dynamo NR (5-13) in their last game on Thursday. Despite her good performance Dynamo NR was edged 61-58 on their home court in Novosibirsk by the one of league's weakest teams Spartak Noginsk (#9). Langlois was the second best scorer with 13 points. She also added 4 assists and 4 steals. Langlois has reliable stats this season: 11.8ppg, 4.2rpg, 4.4apg and 2.6spg. She plays currently for the Canadian national team. #6. Forward Meg Wilson (188-94, college: Simon Fraser, currently plays in Denmark) couldn't help Horsholm (5-1) in their game against Amager (4-2) in the Danish Dameligaen, despite her very good performance last Wednesday. She was the second best scorer with 15 points. Wilson also added 8 rebounds in 22 minutes. But the first-placed Horsholm (5-1) lost 79-88 on their home court in Horsholm to the second-ranked Amager in the Group A. Wilson's stats this year are: 14.5ppg, 6.2rpg, 1.5apg and 1.5spg in 22 games. She is a former university international player as she played for the Canadian team four years ago. #7. Former U19 international forward Samantha Cooper (188-95, college: Fairfield, currently plays in Luxembourg) couldn't help Grengewald (9-13) in their game against Amicale (23-5) in the Luxembourg Total League. Despite her very good performance on Saturday night Cooper recorded a double-double by scoring 17 points and getting 10 rebounds. She also added 4 assists. There are only two games left until the end of the Second Stage. So now every game is very crucial. This season Cooper has very high stats. She averages: 20.8ppg, 13.4rpg and 2.5apg. Cooper used to play for the Canadian U19 national team six years ago. #1. Melissa Rondinelli (184-F/C-91, college: Western, currently plays in Belgium) led Laarne to a victory over the league outsider Rebond (3-21) 87-76 in the Belgian Top Division Women in Sunday night's game. She was MVP of the game. Rondinelli scored 27 points (!!!) and blocked 2 blocks. KBBC Upkot Sparta Laarne (9-17) is placed eighth in the Top Division Women. There are only two games left until the end of the Play-Out Round. So now every game will be critical. Rondinelli has reliable stats this season: 12.8ppg, 4.3rpg and 1.5bpg. She has a dual citizenship: Canadian and Italian. #2. Sara Simovic (173-G-95, agency: BeoBasket, college: UFV, currently plays in Croatia) could not help one of league's weakest teams Pula C.Tours (16-6) in their last game. Despite Simovic's good performance Pula C.Tours lost 76-83 on the road to the higher-ranked (#3) ZKK Split. She recorded 11 points and added 3 assists in 35 minutes. It was Pula C.Tours' first loss after four consecutive victories. Simovic's stats this year are: 12.9ppg, 5.5rpg, 2.7apg and 1.9spg in 23 games she played so far. #3. Experienced Rachael Vanderwal (175-G-83, college: Boston U., currently plays in Spain) was not able to help Gernika (18-8) in their last game on Wednesday. Despite her good performance Gernika was defeated 76-69 at home by the much lower-ranked Valencia (#19). Vanderwal was the second best scorer with 14 points. She also added 6 assists. Vanderwal's total stats this season are: 7.8ppg, 3.3rpg and 2.5apg. She is another player who holds two passports: Canadian and British. #4. Kim Pierre-Louis (183-F/C-93, college: Massachusetts, currently plays in Germany) managed to help Gruener Stern Keltern in a victory against the closely-ranked BC Pharmaserv Marburg (15-5) 75-61 in the German DBBL on Sunday night. Pierre-Louis recorded only 4 points and grabbed 13 rebounds in 23 minutes. It was the game of the round between two top 4 ranked teams. Gruener Stern Keltern (15-5) is placed second in the DBBL. It was her team's eighth consecutive victory in a row. Pierre-Louis' stats this year are: 14.1ppg and 7.5rpg in 23 games. #5. Jessica Lubin (185-C-90, college: UQAM, currently plays in Slovakia) was not able to secure a victory for Piestanske Cajky (7-5) in their game against MBK Ruzomberok (11-1) in the Slovakian Extraliga. Despite her good performance in Saturday night's game She recorded 11 points. Lubin's stats this season are: 12.8ppg, 6.7rpg, 1.1apg and 1.4spg. #6. Rachael Bland (, college: Lakehead, currently plays in United Kingdom) contributed to an easy victory against one of league's weakest teams Archers 77-59 in the British WBBL in Saturday night's game. She scored 6 points in 23 minutes. This year Bland's total stats are: 3.1ppg, 4.5rpg, 2.2apg and 1.1spg in 19 games. #7. Tessa Boyd (, college: Ottawa, currently plays in Australia) contributed to an easy victory against the 11th-ranked Wildcats 89-72 in the Australian State League (second division) last Friday. She recorded 7 points. This season Boyd averages only 6.2ppg. #1. This week's number one is former international forward Katherine Plouffe (190-92, college: Marquette, currently plays in France). She led Bourges to a victory against the seventh-ranked Villeneuve D'Ascq (9-12) 72-68 in the French LFB in Sunday night's game. Plouffe had a double-double by scoring 12 points and getting 14 rebounds. She also added 3 assists and 4 steals in 30 minutes on the court. Tango Bourges Basket (17-4) is placed second in the LFB. It was her team's eighth consecutive victory in a row. They will play only one more game in the Regular Season. And that game will be critical. This year Plouffe averages: 9.4ppg, 4.7rpg, 1.7apg, 1.3spg, 2FGP: 46.3%, 3FGP: 25.0% and FT: 57.9% in 19 games she played so far. She played for the Canadian senior national team two years ago. #2. Second place goes to an international forward Michelle Plouffe (193-92, agency: Basket Promotion Agency, college: Utah, currently plays in France). She contributed to an easy victory against one of league's weakest teams Nantes Reze (5-16) crushing them 100-63 in the French LFB on Sunday night. Plouffe scored 11 points, had 7 rebounds and dished 3 assists in 24 minutes. Union Lyon Basket Feminin (18-3) is placed first in the LFB. It was her team's third consecutive victory in a row. They will play only one more game in the Regular Season. And now that game is very crucial. Plouffe has relatively good stats this year: 12.1ppg, 6.1rpg, 3.8apg, 1.6spg, 2FGP: 49.5%, 3FGP: 31.2% and FT: 84.3% in 21 games. She is in the roster of the Canadian senior national team. #3. The Canadian player who performed third best last week abroad was former international swingman Cassandra Brown (189-92, college: Portland, currently plays in Greece). Brown was the major contributor in an Dafni Agioy's victory against the league outsider Athinaikos (2-17) crushing them 98-77 in a derby game in the Greek A1 in Sunday night's game. She recorded a double-double by scoring 20 points and getting 10 rebounds (made all of her five free throws). AO Dafni Agioy Dimitriou (11-8) is placed fourth in the A1. There are only three games left until the end of the Regular Season. So now every game will be important. This season Brown has relatively solid stats: 14.5ppg, 5.5rpg, 1.1apg, 2FGP: 51.9%, 3FGP: 35.5% and FT: 80.3%. She played for the Canadian national team five years ago. #4. Power forward Adut Bulgak (193-92, college: FSU, currently plays in Israel) could not help Maccabi Ramat Gan (14-9) in their last game. Despite Bulgak's very good performance the fourth-placed Maccabi Ramat Gan (14-9) lost 57-72 on the road to the bottom-ranked (#10) Ashdod in the Places 1-6 group. She had a double-double by scoring 15 points and getting 18 rebounds. Bulgak also added 3 assists in 36 minutes; quite an impressive performance considering it's only her third season in pro basketball. It's Bulgak's first year with the team. Bulgak has individually a very good season with high stats. She averages: 17.9ppg, 11.8rpg and 1.2apg in 17 games. Bulgak has a dual citizenship: Kenyan and Canadian. She used to play for the Canadian national team back in 2016. #5. International small forward Jamie Weisner-Scott (178-94, agency: LBM Management, college: Oregon St., currently plays in Russia) led Dynamo NR to a victory over the league outsider Dynamo Moscow (0-18) crushing them 88-53 in the Russian PBL on Monday night. Weisner-Scott was MVP of the game. She scored 22 points and grabbed 4 rebounds (went 8 for 8 at the free throw line); not bad, considering it's only Weisner-Scott's third season in pro basketball. Dynamo Novosibirsk Region (5-13) is placed eighth in the PBL. Weisner-Scott has reliable stats this season: 14.3ppg, 5.1rpg, 1.7apg and 1.3spg. She plays currently for the Canadian national team. #6. Power forward Miranda Ayim (191-88, college: Pepperdine, currently plays in France) contributed to a Basket Landes' victory against the tenth-ranked Hainaut (7-14) 61-47 in the French LFB in Sunday night's game. Ayim scored 11 points, had 5 rebounds and made 2 blocks in 23 minutes. Basket Landes (11-10) is placed sixth in the LFB. Her team will play only one more game in the Regular Season. And now that game is quite important. Ayim is one of the most experienced players in a team as it's her fourth year in Basket Landes' roster. Ayim's stats this season are: 13.4ppg, 4.9rpg and 1.2spg in 21 games. She is an international player who is currently on the senior Canadian National Team roster. #7. International guard Bridget Carleton (185-97, currently plays college basketball in the States), who plays in the NCAA was not able to help the the league outsider Iowa St. in their last game on Monday. Despite Carleton's very good performance the Iowa St. was defeated 69-60 in Springfield by the Missouri State University. She recorded a double-double by scoring 31 points and getting 10 rebounds (went 10 for 10 at the free throw line !!!). Carleton has been at the team for four years. This season Carleton has very high stats. She averages: 21.7ppg, 8.6rpg, 4.0apg, 1.2bpg and 2.3spg. Carleton is also Canadian national team player. #8. Power forward Nayo Raincock-Ekunwe (188-91, college: Simon Fraser, currently plays in France) is a teammate of previously mentioned Katherine Plouffe and both played together in the last French LFB game. Raincock-Ekunwe managed to help Tango Bourges Basket in a victory against the seventh-ranked Villeneuve D'Ascq (9-12) 72-68. She scored only 4 points and grabbed 5 rebounds in 23 minutes. Raincock-Ekunwe's stats this year are: 11.4ppg, 6.0rpg, 1.4apg and 1.3spg in 21 games. She plays currently for the Canadian national team. #9. International point guard Miah-Marie Langlois (173-91, college: Windsor, currently plays in Russia) is a teammate of previously mentioned Jamie Weisner-Scott and both played together in the last Russian PBL game. Langlois helped Dynamo NR win their game against the league outsider Dynamo Moscow (0-18) crushing them 88-53. She scored 7 points, had 5 rebounds and dished 6 assists. Langlois averaged so far 11.5ppg, 4.0rpg, 4.0apg and 2.5spg. She is also in the roster of the Canadian national team. #10. Forward Audrey-Ann Caron-Goudreau (193-95, college: Texas, currently plays in Germany) was not able to secure a victory for one of league's weakest teams Eisvogel Freiburg (12-8) in their game against TSV 1880 Wasserburg (12-8) in the German DBBL. Caron-Goudreau recorded 6 points and grabbed 7 rebounds in 18 minutes. Eisvogel Freiburg was edged 81-80 in Wasserburg by the higher-ranked (#4) TSV 1880. Caron-Goudreau averaged so far 10.6ppg, 8.7rpg and 1.9bpg in 16 games. She is a former international player as five years ago she still played for the Canadian senior national team. #11. International guard Nofuente Ceejay (176-93, college: Humber, currently plays in Denmark) was the main contributor in SISU's victory against the third-ranked Stevnsgade crushing them 84-63 in the Danish Dameligaen last Sunday. Ceejay was the best player in that game. She recorded a double-double by scoring 32 points and getting 10 rebounds. Ceejay also added 5 assists and 7 steals. This season Ceejay has very high stats. She averages: 19.3ppg, 9.4rpg, 5.5apg and 4.6spg. Ceejay plays currently for the Canadian national team. #12. Former U19 international guard Aislinn Konig (175-98, college: CAN NT U16, currently studies in the States), who plays in the NCAA couldn't help the NC State (9-9) in their last game on Saturday. Despite Konig's good performance the NC State was badly defeated 79-61 at home by the University of Iowa. She recorded 10 points and added 5 passes. Konig averaged so far 10.7ppg, 2.4rpg and 3.8apg. She used to play for the Canadian U19 national team back in 2017. #13. International guard Shaylisha Colley (173-96, is currently at the American university) couldn't help the Michigan St. in their game against the University of Notre Dame in the NCAA National Tournament Round 2. She scored 5 points, had 4 rebounds and dished 8 assists. Her team was crushed by 28 points 91-63. Colley averaged so far 14.1ppg, 5.3rpg, 3.5apg and 1.6spg. She is also Canadian national team player. #14. Former U19 international forward Samantha Cooper (188-95, college: Fairfield, currently plays in Luxembourg) helped Grengewald win their game against the second-ranked Musel Pikes 81-75 in the Luxembourg Total League in Saturday night's game. Cooper had a double-double by scoring 13 points and getting 20 rebounds. She also added 8 assists in 40 minutes. Cooper has very impressive stats this year: 21.2ppg, 13.5rpg and 2.4apg in 22 games. She used to play for the Canadian U19 national team back in 2013. #15. International swingman Kimberley Gaucher-Smith (183-84, also represented by Basket Promotion Agency, college: Utah, currently plays in France) couldn't help Mondeville in their game against Flammes in the French LFB. Gaucher-Smith cannot count Sunday's game as one of the best ones. She scored only 2 points. Her team was crushed by 26 points 70-44. Gaucher-Smith averaged so far 12.4ppg, 5.9rpg, 2.0apg and 1.2spg. She is also in the roster of the Canadian national team. #1. Kim Pierre-Louis (183-F/C-93, college: Massachusetts, currently plays in Germany) led Gruner Stern Keltern to a victory over the 14th-ranked Goettingen (7-18) crushing them 100-52 in the German DBBL last Sunday. Pierre-Louis was MVP of the game. She recorded a double-double by scoring 32 points and getting 11 rebounds. Gruener Stern Keltern (15-5) is placed second in the DBBL. It was her team's eighth consecutive victory in a row. Pierre-Louis has relatively good stats this season: 14.9ppg and 7.4rpg. #2. Jessica Lubin (185-C-90, college: UQAM, currently plays in Slovakia) could not help Piestanske Cajky (7-5) in their last game on Wednesday. Despite Lubin's good performance Piestanske Cajky (#2) was edged 54-52 on the road by the lower-ranked Young Angels (#3) in the Places 1-4 group. She was the second best scorer with 11 points. Lubin also added 9 rebounds. It's Lubin's first season with the team. She averaged so far 12.8ppg, 7.0rpg, 1.1apg and 1.4spg. #3. Sara Simovic (173-G-95, agency: BeoBasket, college: UFV, currently plays in Croatia) was not able to help Pula C.Tours (16-6) in their last game. Despite Simovic's good performance Pula C.Tours lost 59-71 in Pozega to the lower-ranked (#9) Plamen. She recorded 10 points and grabbed 8 rebounds in 32 minutes. It was Pula C.Tours' first loss after four consecutive victories. The Regular Season already ended. It's Simovic's first season with the team. Simovic averaged so far 13.0ppg, 5.6rpg, 2.7apg and 1.9spg in 22 games she played so far. #4. Experienced Rachael Vanderwal (175-G-83, college: Boston U., currently plays in Spain) was not able to secure a victory for Gernika (17-8) in their game against Gipuzkoa UPV (14-11) in the Spanish LFB. She recorded only 4 points and added 4 assists in 17 minutes. Gernika lost 70-82 at home to the lower-ranked (#6) Gipuzkoa UPV. Vanderwal's team will play only one more game in the Regular Season. This year Vanderwal's overall stats are: 7.6ppg, 3.3rpg and 2.5apg in 25 games. She has a dual citizenship: Canadian and British. #5. Ashley Polacek (165-G, currently plays college basketball in the States) contributed to an Appalachian St.'s surprising victory against the Marshall University (11-7) 83-71 in the NCAA National Tournament Round 2 last Monday. Polacek scored 13 points and grabbed 5 rebounds in 37 minutes. The Appalachian State University has not so impressive 6-12 conference record this season. Her team will play only one more game in the NCAA National Tournament Round 2. Polacek averaged so far 10.2ppg, 3.2rpg, 2.9apg and 1.2spg in nine games. #6. Kendra Asleson (183-F-91, college: Alberta, currently plays in Australia) was the major contributor in a North Bears' victory against the third-ranked Bruins crushing them 88-49 in the Australian State League (second division) on Sunday night. Asleson scored 13 points and grabbed 4 rebounds in a mere 18 minutes. Asleson averaged so far 14.0ppg, 5.0rpg and 1.5apg in two games. #7. Oceana Hamilton (193-C-95, college: Northwestern, currently plays in Australia) couldn't help Eagles in their game against Sabres in the Australian State League (second division). She scored only 4 points and grabbed 6 rebounds. Her team were defeated 63-55. Hamilton averaged so far 11.4ppg, 8.4rpg and 1.4bpg. #8. Tessa Boyd (, college: Ottawa, currently plays in Australia) contributed to an easy victory against the 14th-ranked Ballarat Rush crushing them 89-68 in the Australian State League (second division) last Saturday. She scored 6 points in only 14 minutes. This year Boyd averages only 3.0ppg in two games.